Grapes are getting ready at Garré Winery. 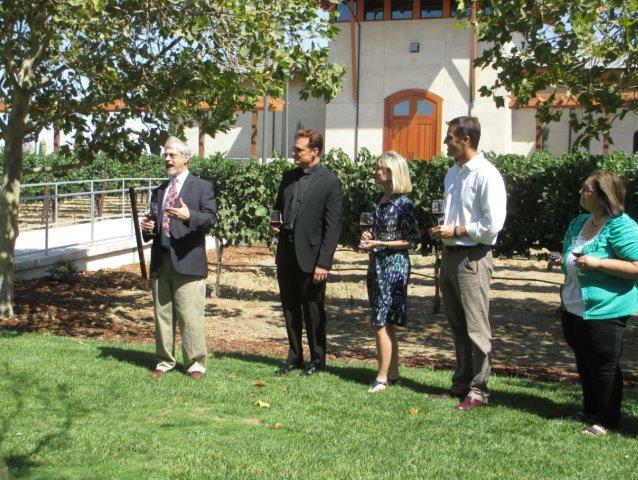 This week I attended the annual Blessing of the Grapes in Livermore Valley. 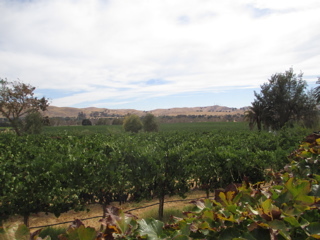 The event was held at Garré Winery. Pastor Wilde talked about the need for help from above for a successful harvest: sun, soil, rain and more all need to come together for the grapes to grow. 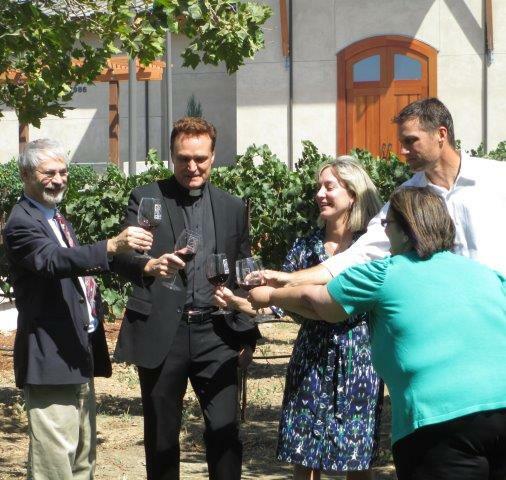 Father Wiesner talked about the many connections between grapes, wine and the Catholic faith. Rabbi Milder pointed out that Noah is the first person to plant grapes and make wine (Genesis 9:20-21). 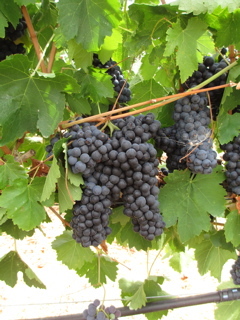 He also told us about the Jewish prayer for wine, which essentially thanks G-d for creating the fruit of the vine. Finally, he led us in the traditional Jewish toast, “L’Chaim”, which means To Life. I hadn’t been to Garré in a few years. It has always been a nice place to visit, especially for lunch, since they have a nice café. They also have bocce courts, which are fun for adults and good to keep kids entertained. They also have recently built a new event center. We had Garré wine as part of the event, and it seems to me that we should go back for a more formal tasting at the winery. Also, the next major event in the Livermore Valley is the Harvest Wine Celebration, taking place over Labor Day Weekend. If you’re around, this is a great way to spend a day. Wineries will have their wines for tasting, and also fresh food vendors, local artisans and music. You do need a ticket; best to purchase online from the Livermore Valley Winegrowers Association. This entry was posted in Grapes and tagged blessing the grapes, Garre Winery, harvest, Livermore Valley on August 23, 2014 by vvblogman. We’ve all had chocolate and red wine at one time or another. A lot of people think this is the best pairing of all wine pairings, and will go to a winery just to get that final big red wine with some sort of dark chocolate. Really, how can you go wrong with this pairing, as individually chocolate and wine are two of the best things in the world? Two of the major food groups for some of us. Chocolate truffles for the Sunday Funday! wine pairing at Las Positas Vineyards. Rosemary Cole: Single origina dark cream with fresh rosemary leaves, virgin coconut oil and lemon zest dipped in dark milk chocolate. English Tea: Dark chocolate cream with black tea and bergamont enrobed with dark chocolate. Darkeriuse: Dark chocolate cream dipped in dark milk chocolate. Hazel Praline: Dark chocolate cream with hazelnut praline dipped in milk chocolate. Nutmeg Almond: Milk chocolate cream with almond praline cream and roasted almonds dipped in milk chocolate. In addition to Lori and I, we had a friend with us, and this was a great way to help her celebrate her birthday. (She also broke any ties when voting on the pairings.) The unanimous best pairing was the Darkeruise with the Petite Sirah. Great chocolate and great wine. 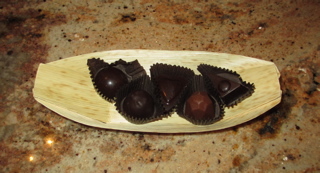 The pairing of the Nutmeg Almond Truffle and Barbera produced the widest ranges of scores in our group, with one voter giving this pairing the highest rank, and one giving it the lowest overall rank. For me, aside from the Darkeruise pairing, the Hazel Praline and the Cabernet Sauvignon was the most interesting pairing. Interesting because when I tasted each individually, I was not impressed with either the truffle or the wine. Together, however, they were excellent, and received my second highest ranking for the menu. A clear case of 1 + 1 = 3, or at least 2.5. Las Positas Vineyards view from the garden. After the chocolate tasting we sat outside in the garden at the tasting room, talking and enjoying the view of the Livermore Valley. 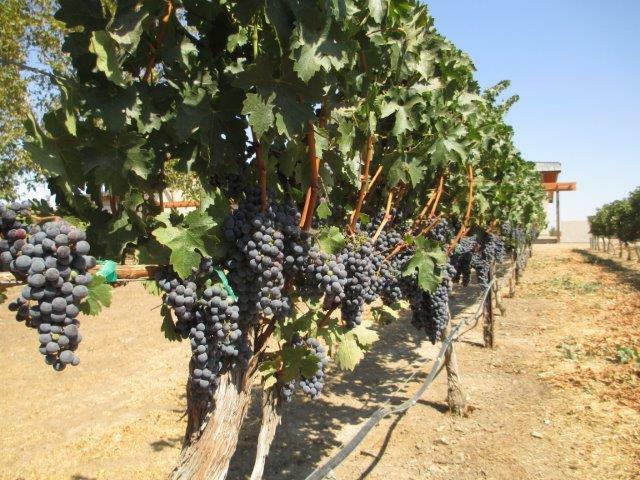 Grapes are getting ready at Las Positas Vineyards in the Livermore Valley. Thanks to Curt, the tasting room manager at Las Positas Vineyards, for spending the time with us on the tasting, and making it a really wonderful experience. This entry was posted in food and wine and tagged chocolate, Las Positas Vineyards, Livermore Valley on August 13, 2014 by vvblogman.